Save gas money and avoid parking hassles: Take the bus to Athens for Sibs Weekend! Send your child on a round-trip, chaperoned bus trip to visit his or her Bobcat sibling, cousin, or friend at Ohio University in Athens, Ohio. Online registration is available on the OU Alumni Association's Web site. Visit ohio.edu/parents for more information about events during Sibs Weekend. The men's basketball team is off to a great start! 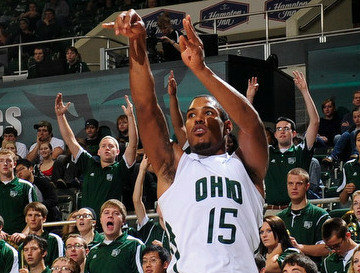 Come to Akron on 1/14 to cheer them on in person, and join fellow OU alumni for a pre-game party! If you remember watching the Shaq of the MAC, don't miss Gary Trent Day at the Convo!